Home E: Lifestyle Don’t Retire, ReFire: Hello 65! 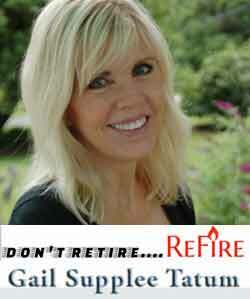 Don’t Retire, ReFire: Hello 65! Some of you may be approaching 65, some of you may be past 65, and some of you may be years away from 65. Wherever you are in relation to age 65, it’s a number that brings many emotions, good, bad or uncertain. For me, the first positive change I that comes to mind is Medicare. I have been waiting for this for a year! Being Self-Employed, I have paid for my health insurance, which is expensive, if you want good coverage. It is a relief, knowing that I now have healthcare that’s much more comprehensive at a much more reasonable price. In keeping with my theme and focus on ReFirement, it’s exhilarating to imagine turning a page in the book of my life to see just the chapter title of, “The Next, New and Invigorating Adventure!” This is not a time to be “put out to pasture”! Oh no, hardly that! Not even close! I have been blessed with good DNA, good health and the desire to do whatever it takes to stay healthy in mind, body and spirit. Eating a clean diet. Examine your current diet. Is it made up of many foods from a box and not from the fresh fruit and vegetable section? When I became more conscience of what my diet consisted of in my 20’s, what I heard and what has stayed with me is that the majority of the shopping cart should be filled with foods from the outer isles, which include mostly the fresh items like fruits, vegetables, meats and dairy items. It’s difficult to completely stay away from processed foods but if your mind is on clean eating you will be more conscience of limiting your consumption of processed foods. Move your body and maintain a healthy weight. It’s the key to preventing many conditions. I didn’t use the dreaded word, exercise, because to many, it’s looked upon as drudgery! Move your body enough to get your heart rate up. Ask yourself what you’re able to commit to? Is your life aerobic because you garden, walk your dog, go up and down stairs a lot, put music on and dance? Recognize these activities as movement, as exercise. We can get so hung up on the thought of exercise meaning that we have to join a Gym or that we have to follow along with DVD Trainer routines that are hard to follow and don’t keep our attention. Adjust your thinking and just move! It’s when our bodies have time to repair and rejuvenate. The body is a fascinating machine and just like machines, they can’t keep running and running without fuel and maintenance. While sleep requirements vary slightly from person to person, most healthy adults need between 7-9 hours of sleep per night to function at their best. Again, it’s a goal that, if you put your mind to it, can be achieved. Do something every day that brings you joy, whether it be talking and making plans with your family, having lunch with friends, taking dance classes, going to a reading group or gardening group, etc.. These are suggestions to jar your memory because maybe you’ve put the things that bring you joy to the side for one reason or another. How about the joy of starting something new! What fun that is! It’s fun even contemplating what that might be! These thoughts bring aliveness to the spirit! It is that aliveness that lifts us up! Joy, fun and laughter is a mantra that would truly bring joy, fun and laughter into your life! The four above areas sound so simple and they are. What can be difficult for us is the implementation. Consistency is must and the key component. This good, solid, sage advice can help, no matter what age you are! If the above points have not been incorporated into your life, through your life, there’s no time like the present. Start now! It is said that the words “always and never” are not to be used because it’s a difficult claim to make, but there are exceptions. The one exception that I claim for myself and for everyone is to ALWAYS remember, “You’re NEVER Too Old”, “It’s NEVER Too Late” and “NEVER Give Up”.